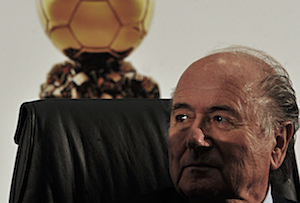 It's up to FIFA to serve football fans, not sponsors, says Nick Fox. The furore surrounding FIFA president Sep Blatter and investigations into corruption at the organising body for the World Cup is one ball that will not be kicked into the long grass. As the scandal snowballs various stakeholders in the tournament now risk collateral damage by association. In particular, the top tier sponsors of the tournament are vulnerable. Last week AB InBev, Coca-Cola, McDonald’s and Visa called openly for Blatter to step down immediately rather than hold on to his position. Now, finally, FIFA has met this co-ordinated call half-way and half-heartedly, with a recommendation from its ethics committee (hmmm) that Blatter be suspended for 90 days. Sponsorship, especially in sport, presents challenges. The right vehicle can give unprecedented access to a huge audience and tap into the enthusiasm of fans, but there can be taint by association if anything untoward occurs. Then the sponsor has to unpack some knotty moral quandaries. Accenture, AT&T, Gatorade and Tag Heuer swiftly ended their association with golfer Tiger Woods following revelations of infidelity. But Nike did not and maybe its unspoken stance that it sponsors sporting prowess not behaviour in private life was the right one. But the World Cup is in a league of its own in delivering a massive global audience of the young, engaged and passionate and the problems are consequently that much bigger. The total amount brought in from sponsorship during the last world cup cycle was $1.6bn (£1bn). I think that both the sponsors and FIFA have taken rash decisions that will prove damaging – but not in the ways you might necessarily expect. I’d argue that the sponsors should not be making calls for Blatter’s resignation and that FIFA should not be seen to bow to them. This may seem counter-intuitive when corruption appears rife, but as a principle no organising body should accede to pressure from sponsors. In sport, such bodies exist to administer the tournaments and serve the fans – without whom the vehicle would have no value. No investigations have been concluded, Blatter has not been found guilty and I’d argue the ‘gang of four’ sponsors have acted prematurely - or too late, depending on your school of thought. What unites the four sponsors calling for Blatter’s scalp is that they are American businesses and I’d wager that their hands have been held close to the flame by US legislation in regard to doing business with ‘disreputable companies’. They have jumped the gun probably earlier than they wanted to and while they might expect praise for ‘taking a stand’ they are taking a business risk. Brands have fans too and McDonald’s, Coca-Cola and the rest are jeopardising their standing among their global target audience with the criticism of Blatter and FIFA. Looked at through US (and UK) eyes they are taking the right action. But many nations, especially developing nations in Africa and Asia, are football crazy, see FIFA as a benevolent entity and operate to different business standards and moral codes. This is an attack on FIFA by sponsors from a rich Western country that does not even place football in the first rank of its national sports. That could do incredible brand damage in the overseas markets where these brands are looking to grow now that domestic business is stalling. I suspect the sponsors know they are treading a tightrope and they should be devising new marketing strategies to win hearts and minds even as I write. I am not letting FIFA off the hook. As mentioned, its first duty is to the global audience of football fans and not the sponsors. They are the people who decide the fate of the World Cup – whether it is embraced or disdained. We have just seen the crisis that has engulfed Volkswagen for focusing on short term profit rather than acting in a transparent manner towards its end customers and any organisation should take heed of the lesson. FIFA needs to reform, but the change has to come from within and not be imposed by external companies. The problem at the moment is, of course, what is ‘the within?’ Reforms cannot come soon enough and FIFA needs to accelerate its decision-making process, make sure it has a clear succession plan and put its own house in order. Otherwise it will be sent off the pitch in disgrace. Nick Fox is a founding partner at ad agency Atomic London. How do you keep sport clean when it's awash with cash?